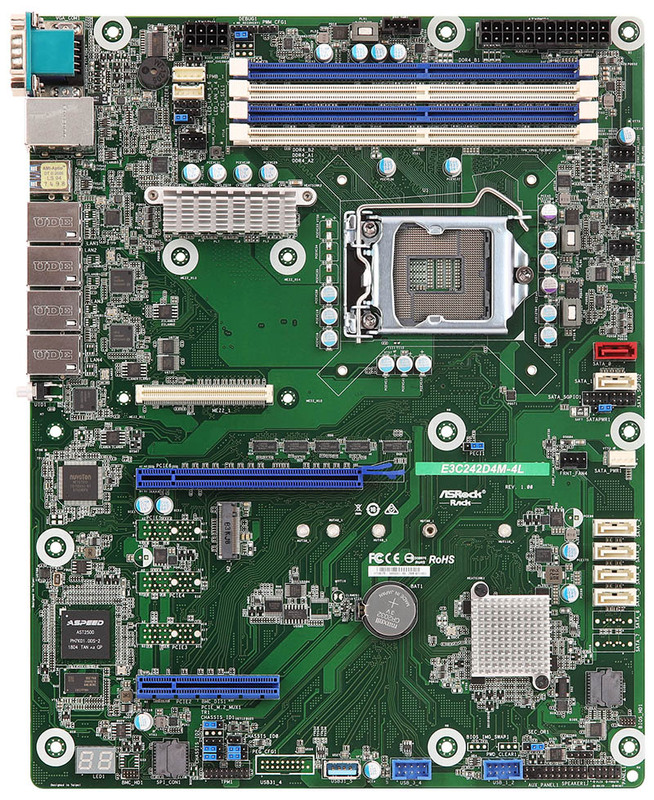 As part of the Intel Xeon E-2100 re-launch, ASRock Rack launched four new motherboards and a new system. During my recent visit to Taipei, Taiwan in late October, I was able to see these motherboards and system in person. Here is a quick look at the new line. During the visit, I saw the ASRock Rack 1U2LW-C242. During our discussion, it was positioned as a low-cost server node for dedicated hosting type deployments. 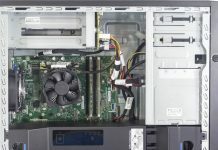 The chassis itself houses an ASRock Rack E3C242D4U motherboard supporting the new Intel Xeon E-2100 series CPUs, like the Intel Xeon E-2176G, as well as lower-cost options like the Intel Core i3-8100. Like other platforms in this class, there are two Intel i210 network ports and support for 64GB of RAM using today’s 16GB DDR4 ECC UDIMMs. 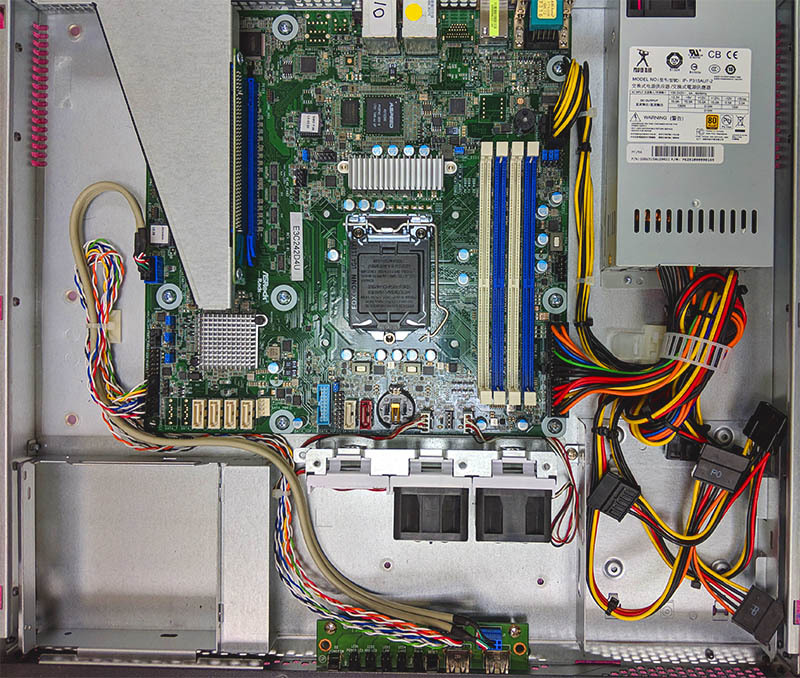 In addition, here is an m.2 storage slot along with a PCIe 3.0 x16 slot via a riser. This is certainly a cost-optimized play without the traditional front facing hot swap bays. At the same time, it does have some premium features. A good example is that the 315W 80Plus Gold rated power supply is a single PSU, but better than the HPE ProLiant DL20 Gen10 290W 80Plus Silver power unit. That efficiency is important in a cost-sensitive market like dedicated hosting. There is a PCIe 3.0 x16 slot, as well as a PCIe x8 and PCIe x4 slot along with an m.2 slot. The Intel C242 is the cost-optimized version, but there is another variant, the ASRock Rack E3C246D4U. 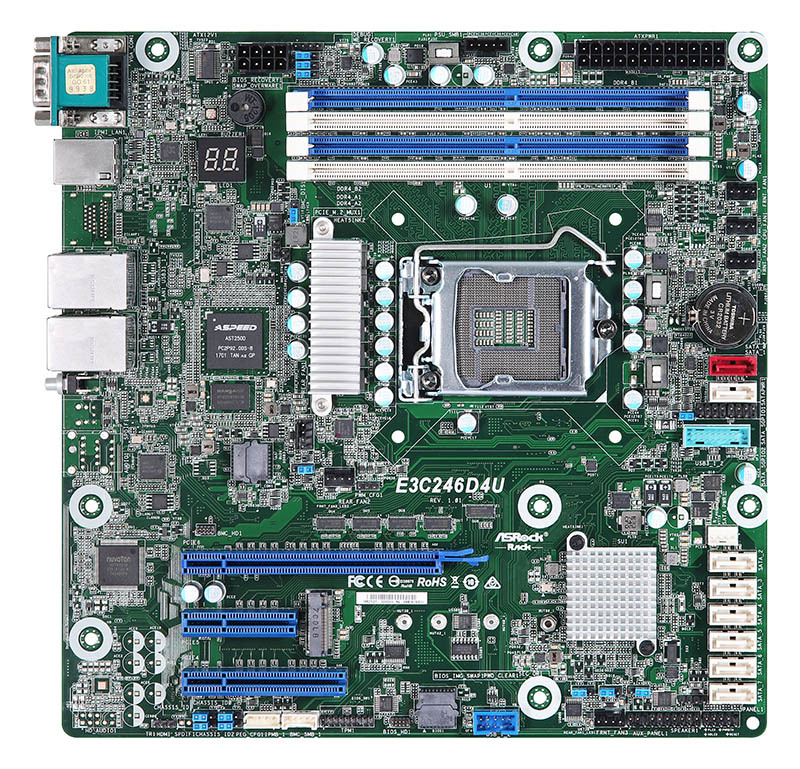 If you like the E3C242D4U, but want a motherboard with a bit more SATA III connectivity and the Intel C246 PCH, then the ASRock Rack E3C246D4U is your option. This is a very similar motherboard but with the higher-end PCH and eight SATA III ports. 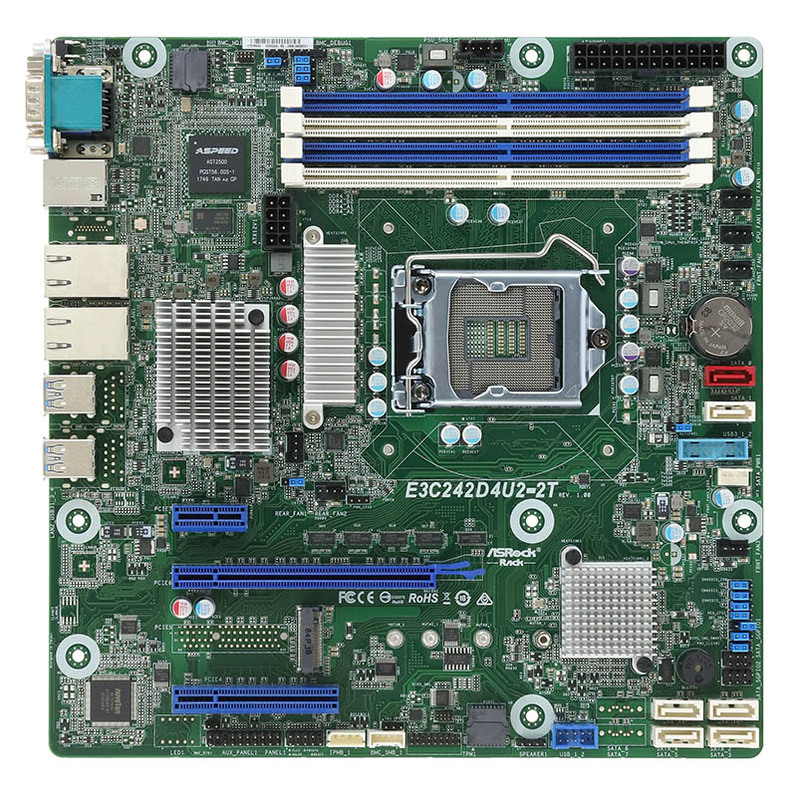 The ASRock Rack E3C242D4U2-2T adds two 10Gbase-T networking ports based on the Intel X550-AT2 NIC. We originally thought this was a simple variant of the E3C242D4U. Although in many ways similar, it instead appears to be a different PCB. There is a PCIe 3.0 x4 slot de-populated and a PCIe x1 slot added. One can see many of the components move on the motherboard, including the BMC and SATA ports. Between the rear I/O and the CPU socket you can see an absolutely massive heatsink cooling the 10Gbase-T NIC. 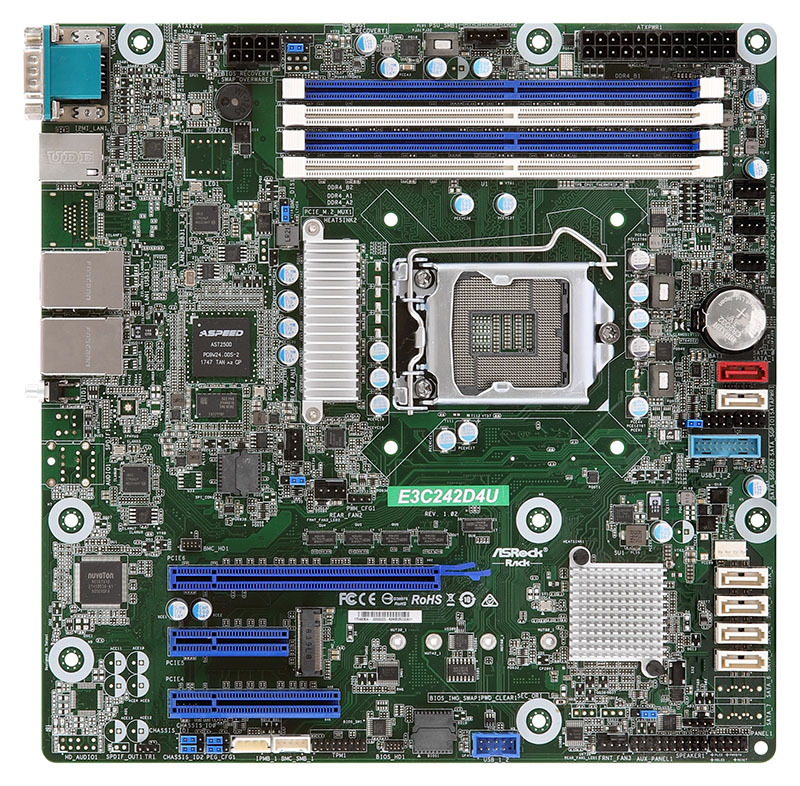 For ATX applications, the ASRock Rack E3C242D4M-L takes advantage of the additional PCB size. Overall, it was a great visit with the ASRock Rack team. We saw a ton of interesting product. You can see all three of the Intel Xeon E-2100 series motherboards and the server platform all on display. 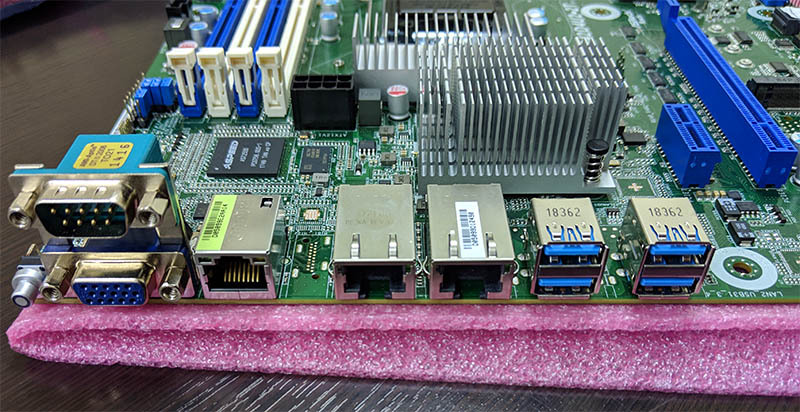 We also saw ASRock Rack EPYCD8 platform, as well as platforms for LGA2066 (mITX) and the Intel Xeon D-2100 / Atom C3000 series. You may notice this is captioned “partial” motherboard spread. There were quite a few upcoming products that we discussed that STH readers will be extremely excited about. Nice systems. 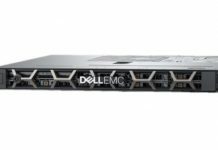 EPYC, C3000, Xeon D please. Wow @Patrick wrote a newsy piece for the first time in ages. I thought Cliff was doing this for STH now? He did all the others. I’m with Timofeym on others too. 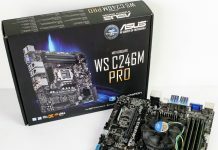 Ooh, what’s that ITX board? Andrew – that particular one is an LGA2066 motherboard. There is another one not pictured.